Opera Multi Steel was born during the winter 1983-1984 in Bourges, a city in the centre of France. In the beginning, the band was first set up by Franck Lopez, his brother Patrick L. Robin and Catherine Marie. A four track 45 RPM recorded in 1984, was the first essay of the group in studio work. The following year saw the releasing of « Cathedrale », a 10 track album dedicated to this famous gothic building of Bourges. The band gave numerous concerts and played in several french festivals. It also contributed to many K7 and record compilations on french and european independant labels. 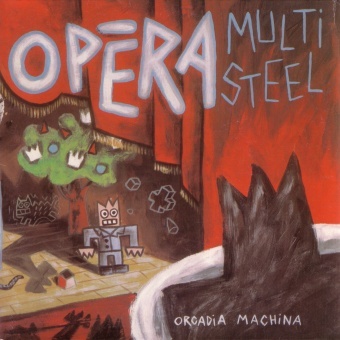 In parallel to its official discographic work, Opera Multi Steel recorded with lighter sound material several K7s containing many unreleased tracks: « Autres Appels » (1985), « Eternelle Tourmente » (1986), « OMS/Modern Art » (1987), « Je Regarde la Pluie »(1987), « Regret qui s’ιcaille » (1987), « OMS in Concert » (1987). These different limited edition tapes are nowadays deleted and are considered as real collector’s items. Xavier Martin, an electric guitar player joined the band in 1987 for the studio session of « Personne ne dort », a 2 track 45 RPM with a sleeve designed by the famous french painter Speedy Graphito. Xavier, above all very fond of Hard Rock (!?) did not stay a long time; he left the group after one year of activity. It was really difficult for him to fit with the peculiar musical style of Opera Multi Steel. In 1988, Eric Milhiet (bass guitar, recorders, keyboards... ), an old friend who had already played with Franck in other bands before OMS, joined the band for the recording session of the 8 track album « A Contresens ». This heterogeneous album is considered as a real step between two different periods of OMS. « Les Douleurs de l’Ennui », a 11 track album, was released in 1990. The sleeve was decorated with a painted photograph made up by Pierre et Gilles, designers from Paris. It represent a female medieval knight. On this record appeared for the first time Jean-Marc Bougain (drums and percussions). The quartet became a quintet and the rythmic section of OMS was from now on thicker and louder on records as on stage. The recording of « Stella Obscura » spread over the twelve months of 1991. This 17 track album remained temporarily as a kind of testament for OMS since Patrick, the lead singer, a touching, fragile and complex schizophrenic personality, attempted to kill himself at several times, few months after its releasing (1992). He was for a long time sent to a specialized hospital before reintegrating a « normal life ». So, by force, the band had to keep silence. During the summer of 1998, the band came to its usual " Studio du Rempart de la Misericorde " in Dijon (France) to record 11 tracks for a new album : « Eternelle Tourmente » Four of them are new versions of very old songs taken from limited edition K7 s deleted since a long time. The band wanted to give them the chance of a new life.... The 7 other tracks are brand new compositions. The lyrics are written by Patrick L. Robin except one written by the medieval french poet Rutebeuf called " Pauvre Sens... " and another one " Tristesse " by the french realistic poetress Marie Mareau. The sleeve design shows a picture by the Finnish painter Hugo Simberg (1873-1917) called " Wounded Angel " dated 1903. This album is a kind of synthesis of the different musical periods and tastes of the band, folk, medieval , electro- pop darkwave.. On several tracks of this new record may be heard Carine Grieg (Collection d'Arnell Andrιa) who took part to this project while performing additionnal vocals. " Eternelle Tourmente " was released by TRITON in May of 1999. In August 2000, the cd re edition of the whole OMS discography is completed with the outcoming of "A Contresens"
In 2001, the musicians began to work on new tracks for an album to be issued also on Triton. After long months of delays, the album was released at last in early 2003. "Une Idylle en Péril" was recorded and composed by the classical former members of the band with the help of Carine Grieg (CdAA)who performed vocal parts on many tracks. Thibault d'Abboville, also CdAA member since their album "Tristesse des Manes" also performed viola on two songs.This album is melting folk influences supported by acoustic instruments such as mandolas,guitars, flutes and mixed with samples issued from Medieval and Renaissance classic composers.The artwork(by Reno)showing an Angel helping two young people to cross railtracks and protecting them against Fatality is a kind of visual following to the previous booklet on which two young boys were helping a wounded Angel. In March 2005, the cd compilation Transmission The french Cold Wave 1981-1989 issued by Infrastition includes the track « Un Froid Seul » originally released on the first album of the band “Cathedrale” in 1985. In January 2006, the DVD compilation RVB-Transfert Images de la Scene Indépendante française 1978-1991 includes the clip from the same track « Un Froid seul” directed by Michael Gisselere in 1997. In October 2006, one track from the album "Eternelle Tourmente" (1999) is included on the french compilation "Movement One" released by Str8line Records. November 2006, "Du Son des Cloches" taken from the album "Cathédrale" (1985) is included on the compilation 15 issued by Infrastition introducing cold-wave, Minimal, Synth and Touching Pop bands from the 80's/ 90's french Scene.